Someone has set fire to the sky. It feels as though each cloud veils a raging flame and each patch of night is a burnt- out piece of ash. I can smell thick smoke and taste the embers that fall from the sky like snow on a Christmas Day. Through the open window I can see a witch being burnt at the stake. Everyone was convinced she cursed the harvest. Heather knew better, she told me the foul weather was to blame. I suppose it's easier to blame someone rather than something. The witch’s spell books, beaten and battered were thrown into the fire. The pages burnt slowly. Each corner once gently folded, disappeared. Crackles echoed through the empty streets of abandoned houses. Everyone had gathered in the town centre to witness the event, everyone, except Heather and me. We stayed at home. I knew that with every book that turned to cinders, Heather’s heart broke a little more. Heather ran away that night. “Aul’ Heather, the clever one. All she wanted was to read an’ write. If only times were different. Maybe then she'd get a chance..” Grandma would say. It was frowned upon if girls were ‘too clever’ or took a liking to books. 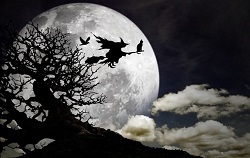 if a girl was caught reading a book she would be punished for practising witchcraft. Incensed, Heather would rant incessantly at this injustice to Father, who would punish her severely for disobedience. He was a god-fearing heartless man. Heather had a funny manner of speaking. She was forever reciting poetry, using complicated words that no one could understand. I pretended not to notice her absence late at night and the unmistakable creak of the door to Father’s study. When she ran away she took nothing except a book she had stolen from Father’s study , a book she hid from everyone. Weeks passed like seconds, months like hours and years... as if she never even existed. It has been three years since Heather left. Late at night we see shadows casting themselves along the lane way beside our home. We hear taps on the windows and creaks on the floorboards. We suspect it's the young lady who has moved in a few doors down. She appears quite strange to us. Although we've seen her scurry down the lane late at night, her face is always hidden by the darkness and her shawl. I often see tufts of smoke rising from the chimney of her wooden cottage. The children outside are afraid to play knick knack on her door because they believe that she will put a spell on them. They have rhymes about her. The children claim to have seen her reading from a book but no one believes little children. One night, driven by curiosity, I tread silently through Father’s study, resisting the temptation to open one of his books. I plunge outside into the darkness. The sky is pure black like coal. It is past curfew but I can see a candle flickering inside her cottage . I peer into the window to see the shadow of a woman reading a book by candlelight. I feel a shudder as a gust of wind blows past and, turn again to look at her, only to find that she's not there. My heart leaps in my chest and I run back home. As evening draws in, Father looks tired and concerned. “Another burning tonight” he remarks. “The young witch from the wooden cottage” he replies. 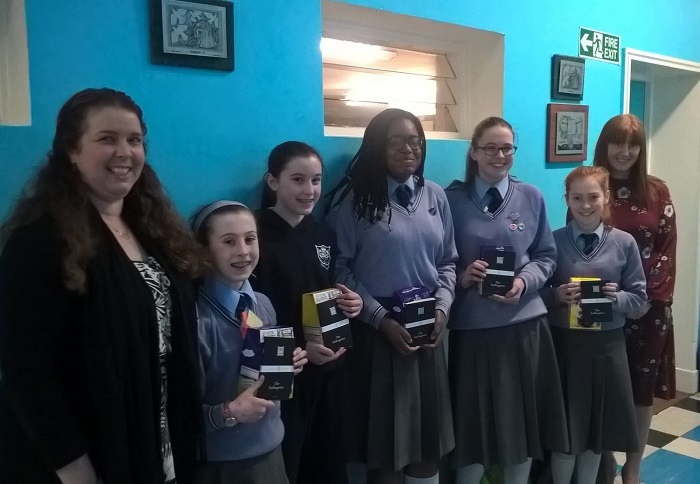 The winners of our International Women's Day research essay competition were presented with their prizes on 20 March. They are pictured here with our Deputy Principals, Ms Dunwoody and Ms Fields. Well done to Patricia Sheve-Bleikks, Mia Challoner, Ella Connolly, Goodness Igbinosum and Alison Grealy! Thanks to Ms Doherty for sending in this report. Gentle snowflakes were floating down from the sky, the wind caressing them as they fell. As Sophie White watched them dance, her mind wandered back to the last time she had seen it snow, and the memories she had tried so hard to suppress came rushing forth. The frost-coated grass crunched underfoot as Sophie crept up the driveway. She glanced back at the house, watching for the bedroom light that would indicate her absence had been noticed. She laughed quietly to herself, her breath creating patterns in the cold night air. They might not realise she was gone until next week. Snowflakes melted on her eyelashes as she turned her back and ran. She had only one bag, containing a change of clothes, winter boots, two bottles of water and whatever money had been lying around the house a few hours before she made her escape. Whatever the world decided to throw at her couldn’t be worse than being at home, watching her father hang on her stepmother’s every last word, as if she were a goddess, rather than just a middle-aged accountant. She walked until she reached the end of her street, before cutting through the forest cycle path. As she continued on her way, the lush oaks were slowly morphing into thick coniferous vegetation, and the pine needles entangled themselves in her raven locks as she weaved through the thick forest. Just as the sun began to rise, she noticed a ramshackle cabin, located in what seemed to be a man-made clearing, as it was surrounded by stumps and rotting tree limbs. A small man was leaning up against the door, smiling broadly at her. “Want to make some cash kid?” he asked softly, gesturing towards the cabin. She frowned slightly, repeating his words in her mind. Make some cash? She wasn’t naïve, she had to live off something, and here was her opportunity. “Why not?” she smirked, returning his wide grin, heading up the drive. 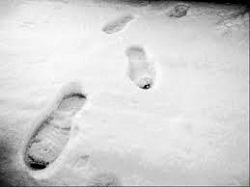 Before entering the cabin, she glanced back, and noticed that her footprints in the fresh snow had already been filled up by the now heavy snowfall. No going back now. It turned out the small man with the wide grin had been the ring-leader of a criminal gang known as the “Dwarves”, so called because of their small statures. They were notorious for their involvement in the illegal poison apple trade, and had been looking for a new recruit when they noticed Sophie stumbling up the drive. From that day forward she was caught up in their spiral of greed, money and lies. Sophie took care of the business side of things. She kept track of who owed them what, and made sure it got paid, preferably as promptly as possible. She was never trusted with the same amount of information as the seven original members, but that didn’t bother her too much. She preferred to focus on the numbers, and tried her best to forget about the lives behind them. She had been working there six months when she was left alone in the cabin for the first time. The Dwarves were at a business meeting, down the old mine-shaft. That was the only information she had been given. The less you know the less you can tell. She had never really been that interested in the apples up until then. They were simply figures to her, digits on a page. But as she sat there, bored and lonely, she thought to herself, “What could one bite do?” It didn’t take long for her to locate a batch; they were stashed all over the house. Walls had been hollowed out to make space for them, and if you pulled up a floorboard you had a one in five chance of finding some buried there. “Just one bite,” she reassured herself. The crisp skin of the apple crunched as she dug her teeth in, and a strange, fragrant taste filled her mouth. Then, she started her slow descent, falling down slowly into darkness. She woke up in a hospital bed the next morning, diagnosed with an over-dose of poisonous apples. An investigation soon commenced, which landed three of the seven Dwarves in jail, while the rest fled the country to avoid arrest. Sophie had also been charged. She was the only one accused who pleaded guilty. For the first time she had been forced to face the impact of her split-second decision. Families had been torn apart, and lives destroyed by her involvement, and she was more than willing to pay the price, though it couldn’t compare to the price paid by the families of those her crimes destroyed. The flurry had stopped, and a continuous drizzle took its place. Sophie shut her eyes, and listened to the sound of a crow in the distance before falling asleep with her damp cheek against the rough concrete of her cell wall. Sleep came as a relief, even nightmares were better than reality.